August has proven another very busy month at LHFC headquarters. Myself and the team have been busy with “The Back Kitchen” Catering Pod. 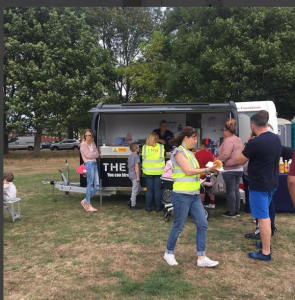 We were in attendance at Stanley Park and Garston Park supporting Liverpool Mutual Homes “Picnics In The Park” community events. The Deckchairs were out. The Sun was shining, and the Flower beds were in full bloom. The parks were packed with people joining in lots of family events. There was pop up play stalls from positivity Inc, pony trails, bouncy castles, acrobatics, tug of war races, park rides and lots more. 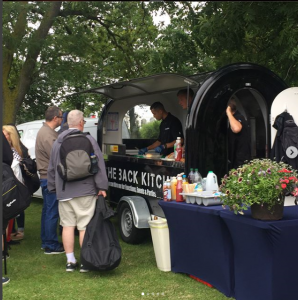 The Back Kitchen staff served the crowds delicious prime beef burgers, gourmet hot dogs, chicken Fajitas. We also provided 2 vegetarian options which were popular. One customer stated “that was the best veggie burgers I have ever tasted” praise indeed! 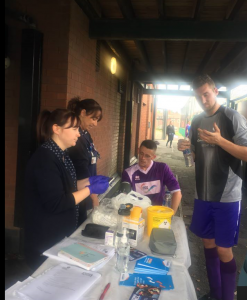 Everyone enjoyed the day and it was another opportunity to raise awareness of the issue of homelessness and highlight the work that LHFC does to support people across Merseyside and beyond. Thanks to Commutual who granted us funding towards our Back Kitchen project. Their generosity enables us to support our volunteers with invaluable work experience. In 2016 Homeless Link statistics showed that 44% of homeless people have a mental health diagnosis, in comparison with 23% of the general population (source: Health Needs Audit, 2016 – Homeless Link). 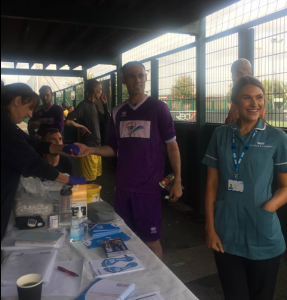 Here at LHFC August was all about raising awareness to mental health issues. We were in collaboration with as many other partners as possible to access and highlight additional support across the region. Mental health problems can affect anyone, and there is no better time to start looking after your own and others mental well being than today. If you know someone who is suffering LISTEN and give support. You could save a life literally! We will be launching a new Mental Health tab on our website. You will be able to access lots of information and links to additional support across the region. I would like to formally welcome our latest team to join the tournament from Bed Space. They were able to fit into Everton In The Community and Brennan FC. Despite the language barriers the players settled in nicely and played some great football. Thank you to everyone who completed the evaluation forms and our surveys your kind words and comments mean a lot and help us to understand what you like most about the events and where we can improve. We are glad you all enjoy the tournaments. It’s your feedback and being a part of your journey that makes it all worthwhile. We do listen and we will publish the findings of our surveys in due course. A special thank you to all our healthcare guests who provided a wealth of vital information to improve participants health. Thank you to Siobhan and Paula from Boots who joined us providing lots of useful information and demonstrations about eye care. They were able to arrange lots of referral appointments at their Liverpool 1 City Centre Store. 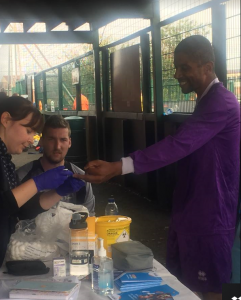 Another massive thank you to the Diabetes nursing staff who provided onsite diabetes and blood pressure tests. Thank you for making a very serious matter fun and for getting so many vulnerable, isolated adults involved. Dietary plans and individual assessments were carried out to follow up on last month’s GP referrals. Some have actually visited their own GP’s. They are now receiving lifesaving treatments that might have gone unnoticed during this period of chaos. A gentle reminder from the FA referees: Please register by 10:00 ready for a 10:30 KO. Late registration results in delayed fixtures and causes unnecessary problems.